BED BUG BITES PICTURES on HUMANS: BED BUGS and BED BUG SYMPTOMS. Welcome, here you will be able to find a selection of bed bug bites pictures on humans, close-up photos and images of the proof of a nightly visit from these nasty creepy-crawlies. The page is made to help you identify your bites. Bed bug bites can be identify from spider and mosquito bites, and even allergy. And what is more, the bed bug bites symptoms can vary a lot from person to person, depending on the individual allergic reaction. For more information on bed bug bites, see the HOME page and the page called WHAT DO BED BUG BITES LOOK LIKE, where a more indepth description of bed bug bites symptoms can be found. Bed bugs bites usually itch more than a mosquito bite and the bite can be felt only after a period of one hour (or in some cases a few days, or even a week). This happens due to the presence of anesthetics in the bed bugs saliva, which prevents clotting of blood. This will help the bed bugs to feed without interruption. As mentioned for some people, it will take a few days or even after a few weeks before the rashes or bites appear. This is due to the individual body’s reaction to the chemicals in the bugs’ saliva. The bed bug rash itself isUSUALLY a small, red and round bump, similar to that of a mosquito bite, but with more swelling. Bedbugs and Bed Bug symptoms. Bed bug bite pictures. Click twice on a image to enlarge it. 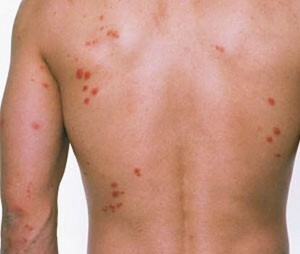 BED BUGS BITE PHOTO: The bites are red and usually located near to eachother, as one bed bug will bite 3 or 4 times. 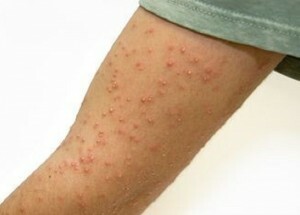 Bed bug bites picture on humans: A severe bed bug attack on an arm. Bed bug bites pictures on humans: Bedbugs have had a feast on this poor guy. 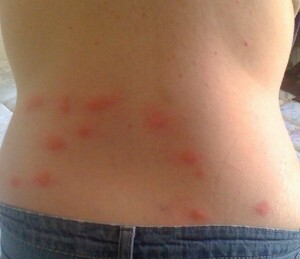 Bed bug bites will often, but not always, turn from red swelling to blisters, as in this photo. BED BUG BITES ON the BACK: The 3-in-a-row bite pattern is typical in bites from bed bugs. BED BUG BITES PICTURES: A typical picture of what bed bug bites look often look like. Notice how just the underarm has been bitten, and not so much the upper arm. This is probably due to the easy access to the underarm in this particular persons' sleeping position. - For more pictures of bed bug bites, please see What do bed bug bites look like. For more information on the appearance and treatment of the bedbug bites please see the Bed bug bites home page. Have you had any bad experiences with bed bug bites? Can you recognize the kind of bites in the pictures shown here? How did you treat the bites? -Please leave a comment below or on the home page. my name is kurtis i started dealing with bed bugs in aprtment complex i lived in in west lansing somebody sprayed a over the counter pestacide in a third floor apartment and it spread to the rest of the apartments they sprayed for 4monthe starting april 2011 so after my mom a nurse talked to them they finally heat treated . It got rid of them for a 11 months and i got 6 bites on the left side of my face very large and noticable i tried to get them to heat treat againg they wouldnt . they said they would spray but i would have to pay for it i told them that is there responability. So they sprayed again did no good they started to infest the apartment so i moved worrrid i still have a few my knew land lord had rose come through they said i didnt have any they brought the dog through they didnt detect any. But i still beeen geeting bit i had some in my car so i took acarpet extractor seeem to help when through my apartment and washed all my furniture pictures in hot hot water washed all my laundry in hot water and dried it in the dryer in hot heat vaccumed along the base boards. Seems to be helping but im afraid they might be living in my skin how do you know if they live in your skin.It has cause me insomia,stress,and mental anguish i really dont know what to do im tired of this its hindered me from doing my job like i usually do.Im oppen for suggestions.